By Cliff Seal on December 31, 2014 . Filed Under: eCommerce, International. 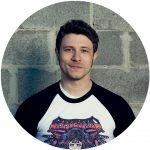 If 2015 is the year for you to take your online store up a notch, Evermore’s got a couple of new things that will get you set up for success. On January 1, 2015, new rules around EU VAT go into effect. There’s been a lot of misinformation surrounding this change, so here’s the long and short of it (based on all my research and others): the VAT liability for EU businesses selling to EU customers has shifted from the country in which the business is based to the one in which the product is bought. Essentially, this is designed to correct some creative tax dodging techniques from huge retailers (think Amazon), but with no minimum sales threshold, it’s caught small EU businesses up in a terrible mess. The interesting thing is that the buzz around these changes has brought attention to the fact that non-EU businesses were supposed to be collecting VAT taxes based on the country in which the product is sold since 2003. Suffice it to say, many businesses had no idea they were in violation of this rule and at risk for audit and penalties. VAT compatibility for small businesses is onerous and may not be worthwhile based on normal sales. Further, it’s unclear exactly how this might be enforced in non-EU countries at all. But, if you’re looking to grow your business, and there’s a chance a substantial amount of sales may come from an EU country, you’ll likely want to bite the bullet. The great thing is that we’ve made this easy with Evermore. Our eCommerce package now has an available integration with Taxamo, which greatly reduces the burden of compatibility from smaller businesses: VAT taxes are calculated based on visitor location, sales are validated, documentation is correctly stored, and reports are generated. All you have to do is register with a VAT Mini One-Stop Shop (MOSS), sign up for Taxamo (which has a free tier), and connect everything together once. For the full details on this feature, read the post from the developers themselves. Please note: I am most definitely not a legal professional. I’m sharing information I’ve found, based on my understanding. Evermore is not responsible for your compatibility with any law—you are. We simply aim to provide the tools you need to make your business succeed. Ignore VAT laws at your own risk. All designs on Evermore have been eCommerce-compatible from the start. No matter how your site looks, selling your goods is easy, looks great, and works for visitors. However, all the designs have been structured to feature your content first. 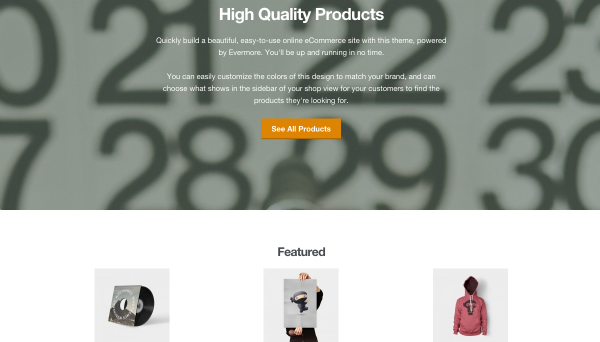 A new design is now available on Evermore that’s all about your products. It’s called Storefront—check out the demo. It’s beautiful, simple, fast, and brings attention directly to your products without a bunch of clutter. You can change all the colors to suit your brand and customize what shows where. It’s incredibly easy to work with, and you can be set up to sell quickly. As always, get in touch with any questions you might have, and we’ll be happy to answer. Here’s to your businesses (and personal) growth in 2015!